Monday’s eerie pink and orange skies made people feel simultaneously excited and uneasy, so it was an entirely appropriate day for Belgian chanteuse Mélanie de Biasio to choose for this rare London appearance: her songs evoke similar reactions. The music is unclassifiable, unless you want to use phrases like psychedelic post-apocalyptic electro-jazz minimalism, which I really don’t. She’s all about mood, and a quite specific mood at that, albeit one that’s very difficult to describe. Even to characterize her singing style as bleak and world-weary, à la (pardon my French) Jacques Brel of Ne Me Quitte Pas or Le Plat Pays, fails to capture the profound strangeness of it all. Maybe there’s a bit of Marianne Faithfull or Nico somewhere in Melanie’s deep repertoire of bruised emotions, but she doesn’t even sing that much; likewise, although her flute-playing is beautiful, reminiscent of Yusef Lateef, she limits it to snatches and brief repeated phrases. The songs contain few, if any, changes: Afro Blue, the one non-original number of the night, was played pretty much on one chord. And while steady, the time is not emphasized, even on a 5/4 tune like I’m Gonna Leave You. The dynamics are likewise minimal: de Biasio and her band establish the vibe, and thereafter it’s largely a matter of small variations until they subside to an often rather indeterminate close. At times this gig felt like a late Sixties ‘happening’, but muted, as if Pink Floyd or the Soft Machine had ingested a whole bunch of downers. So how can music like this possibly be any good? As I mentioned earlier, it’s all about mood: the songs unfurl slowly, like coils of smoke. The packed Scala audience of middle-aged Radio 6 fans listened with rapt attention. In contrast to many concert crowds these days, they didn’t chat and laugh all the way through the gig. 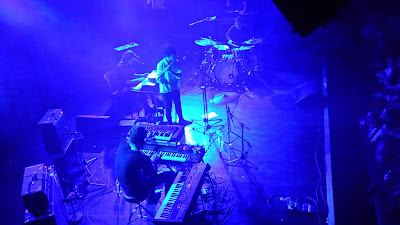 In fact, so quiet were they that you could actually hear the dry ice puffing out of the machine above the stage. Nobody wanted to break the spell. De Biasio achieves this reverential atmosphere by acting as a sort of high priestess: with her boyish haircut, and dressed in a plain white shirt and black tights, she looks rather like Hamlet. Her face is shrouded in darkness most of the time, and she doesn’t address the audience at all until the end of the show, instead striking a series of theatrical poses. Her long-time band consists of Pascal Mohy on Fender Rhodes, Pascal Paulus on synthesizers and guitar, and Dre Pallemaerts on drums. Their approach to the whole enterprise is to play very quietly, and then only when absolutely necessary. The silences and fades are wonderful. Pallemaerts in particular is a master of subtlety and soft power, preferring beaters to sticks, while Paulus teases out velvety tone colours on an array of vintage synths. Mohy and Paulus work around each other with terrific empathy, each sketching in a phrase or a couple of notes here and there as required. Most of all, there is de Biasio herself, the composer of this music, a dark, introverted figure utterly absorbed in the strange worlds she creates. Anyone unfamiliar with Mélanie de Biasio is recommended to follow this link to a live appearance from 2014.